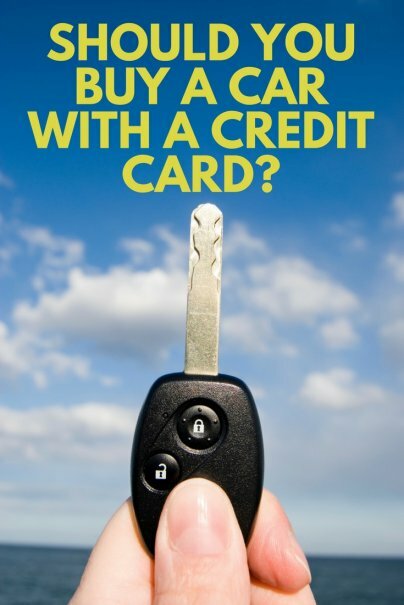 Home » Personal Finance » Cars and Transportation » Should You Buy a Car With a Credit Card? While most people rely on cash or bank financing to buy a car, it may be possible to make all or part of your vehicle purchase with a credit card instead. This might seem like a risky proposition, but there are real, tangible benefits that can come from using this payment method if you're careful. With the right credit card strategy, you could earn rewards for your car purchase, save money on interest, and potentially pay your car off faster. Obviously, there are also a lot of things that can go wrong with this strategy. If you can't afford a car and are looking at a credit card as your way to finance it because you have no other options, forget it. You'll end up worse off if you can't make payments on your credit card. Even if you can afford the car, you'll need to answer a few questions. Let's talk about whether charging it makes sense — and when it's possible. Is it possible to buy a car with a credit card? First, you need to determine whether the dealership or car lot you're buying from will allow it. There are instances when a car lot may let you pay for your entire car purchase with credit, but those situations are rare. More likely, if a dealership lets you pay with a credit card at all, it will cap the amount at, say, $5,000. The main reason dealerships hesitate to let you charge tens of thousands of dollars to your card is that, like other merchants, they pay interchange fees to accept credit cards. These fees are usually around 2 percent, sometimes higher. So, if you charge a $30,000 car, your dealership could be on the hook for at least $600 in processing costs. The other thing you need to note is your available balance. Obviously, you can't charge more than your credit limit, so you'll need to be aware of that limit. While there is more than one way charging your car to a credit card can leave you ahead, the most intriguing opportunity is the rewards you could earn. You can get cash back or travel rewards. You might even want to use a co-branded car credit card (yes, they exist!). This can provide you a hefty discount when you are ready for your next car. Obviously, this strategy is only worth pursuing if you have the cash in the bank to pay your card off right away. While the cards with the most lucrative rewards programs help you earn "free money" on large purchases, the interest rates they offer tend to be higher than average. If you put $30,000 on a credit card that charges 15 percent and it took you five years to pay your loan off, you would fork over $12,822 in interest alone. This leads to the second reason some people may choose to charge their car purchase — to save money on interest. While many rewards cards charge higher interest rates than most, an array of cards charge 0% APR for new purchases for 12–21 months. The key to making a 0% APR card work in this scenario is making sure you can pay the balance in full before your introductory offer ends. Once it's over your rate will reset to a regular credit card interest rate, which is almost certainly higher than the rate you'd get on a car loan. Before you pick a 0% APR card for your car purchase, make sure you can pay the balance in full before the introductory offer ends. That way, you can truly save money on interest — and not end up potentially paying more in interest than if you'd just gone with a loan. If you're dead set on charging your car to a credit card, it's important to think through several important scenarios first. Here are four tips that can help you get the most out of the situation. While there's nothing wrong with using credit for a car, your car salesman may want to make up for their fees by charging you a higher sales price. That's why you should never reveal that you intend to pay with credit until you've negotiated the terms of the sale. By slow-rolling your credit card payment plan, you can get the best price possible while also gaining the benefits of using a card. As with any car purchase, you should research the cars you're interested in online before you ever step into a dealership. Websites like Kelley Blue Book can help you figure out exactly what a car is worth based on its make, model, and condition. If the dealership wants you to pay more than a car is truly worth, the rewards you're earning probably won't be worth it, especially if they decide to tack on a fee for using a credit card. While getting 0% APR on your car purchase can pay off, it's important to do the math if you don't think you'll pay off the entire purchase before the introductory offer ends. If you need several years to pay your car loan in full, for example, you will be better off with bank or dealership financing — even if the ongoing APR seems high. While a slew of popular credit cards offer rewards or 0% APR for a limited time, few cards offer the best of both. Before you charge your car to a credit card, make sure you have defined goals and a plan to reach them. And if you don't have the right credit card to meet your needs for this purchase, explore your card options and apply for a new card before you step into a dealership.